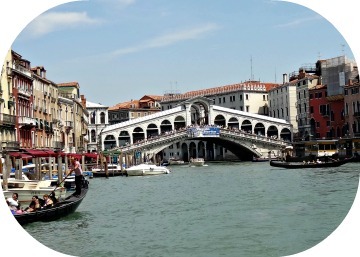 The Rialto Bridge in Venice is called in Italian the ‘Ponte di Rialto’! A wonderful design. It’s huge… It is 48 meters long and 7.5 meters wide and such an old bridge. The bridge is the important crossover between the San Polo district and the San Marco district. Nowadays you can find advertisements on the Rialto and many time they are maintaining the construction. Sponsors are offering money to maintain the bridge in exchange to put an ad on the Rialto. And every tourist who is now looking at the bridge sees ‘advertising'... Venetians are relieved that the bridge is finally being restored. Need sponsoring,,, and looks ugly... Such an old bridge! Take the vaporetto boat from Piazzale Roma, then go under the bridge to San Marco Square. At sunset, it becomes busy with tourists on the Ponte di Rialto. You get a fantastic view with the sun on the palazzo's facades and the sparkle on the water. You can stay on the bridge for hours. 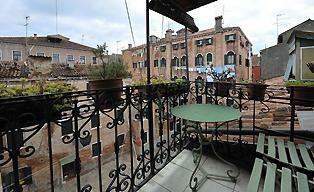 It is one of the most famous Venetian constructions. It is both a pedestrian bridge and a viewpoint over the Grand Canal. The bridge has a wide surface. This is mainly due to the design because it was an extended street of the famous Rialto Market. Antonio da Ponte is the creator of this important bridge over the Grand Canal. The bridge was made of stone in 1591, before it was made of wood. 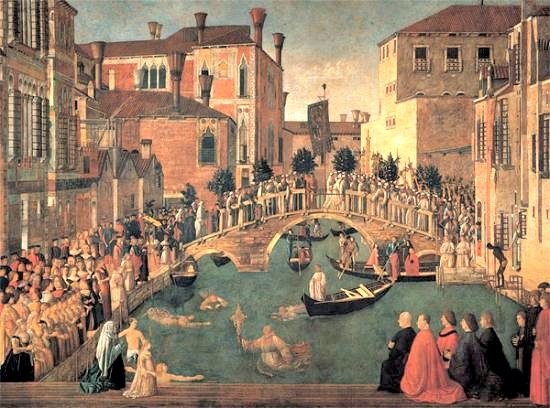 This can be seen on the painting of the Venetian artist 'Carpaccio' from 1496. It is the oldest of the four bridges that cross the Grand Canal. Ever since its existence, the bridge has blown up a lot of dust and discussions. When it was of wood it has been burned several times. And with the reconstruction in stone there was not enough money. The bridge then cost 250,000 gold ducats to build. They then got this together, but many Venetian were against the design and said it was clear that the construction would fail. The Bridge was instable due the quays. But until now, the design holds stand. Nowadays it is seriously under construction (by sponsored money) most of the year. 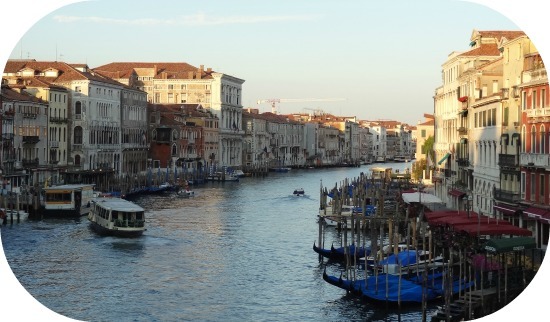 Some Venetians are relieved that the bridge is finally restored. Others find that the bridge still has a terrible design and construction. You have read about the Rialto in Venice. There is enough to discover, as you read. Discover my site about Venice and get more information about this beautiful Italian city.